Curenton, Stephanie, Jocelyn Elise Crowley, and Dawne Mouzon. 2018. “Qualitative Descriptions of Middle-Class, African American Mothers’ Child Rearing Practices and Values." Journal of Family Issues. 39(4): 868-895. Crowley, Jocelyn Elise. 2018. “Incomplete Role Exit and the Alimony Reform Movement.” Sociological Inquiry. 88(1): 32-55. Crowley, Jocelyn Elise. 2018. 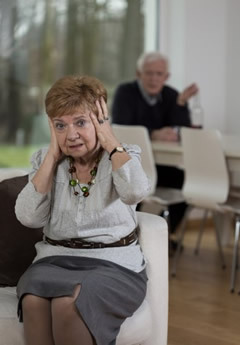 “Gray Divorce: Explaining Mid-life Marital Splits.” Journal of Women & Aging. 30(5): TBD. Crowley, Jocelyn Elise. 2017. “Ambiguous Financial Responsibilities: Second Wives and Alimony Reform Activism in the United States.” Journal of Family Issues. 38(17): 2474–2494. Santucci, Nancy and Jocelyn Elise Crowley. 2016. "Fatherhood Movements." In The Wiley-Blackwell Encyclopedia of Gender and Sexuality Studies, edited by Nancy Naples. Oxford: Wiley- Blackwell. Crowley, Jocelyn Elise. 2015. "Unpacking the Power of the Mommy Wars." Sociological Inquiry. 85(2): 217-238. Crowley, Jocelyn Elise. 2014. "Staying at Home or Working for Pay? Attachment to Modern Mothering Identities." Sociological Spectrum. 34(2): 114-135. Crowley, Jocelyn Elise, and Stanislav Kolenikov. 2014. "Flexible Work Options and Mothers' Perceptions of Career Harm." The Sociological Quarterly. 55(1): 168-195. Crowley, Jocelyn Elise. 2013. "Perceiving and Responding to Maternal Workplace Discrimination." Women's Studies International Forum. 40: 192-202. Crowley, Jocelyn Elise. 2013. "What Mothers Need: Workplace Flexibility," in What Do Mothers Need? Motherhood Activists and Scholars Speak Out on Maternal Empowerment for the 21st Century, edited by Andrea O'Reilly, pp. 351-364. Bradford, Ontario: Demeter Press. Crowley, Jocelyn Elise. 2012. "Strictly for Evangelical Parenting Support? 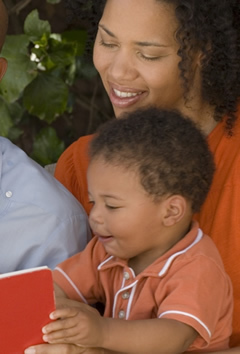 The Case of Mothers of Preschoolers (MOPS)." Review of Religious Research. 54(4): 421-444. Crowley, Jocelyn Elise, Radha Jagannathan, and Galo Falchettore. 2012. "The Effect of Child Support Enforcement on Abortion in the United States." Social Science Quarterly. 93(1): 152-172. Alger, Vanessa and Jocelyn Elise Crowley. 2012. “Aspects of Workplace Flexibility and Mothers' Satisfaction with Their Husbands' Contributions to Household Labor.” Sociological Inquiry. 82(1): 78-99. Crowley, Jocelyn Elise and Stephanie Curenton. 2011. “Organizational Social Support and Parenting Challenges among Mothers of Color: The Case of Mocha Moms.” Family Relations. 60(1): 1-14. Crowley, Jocelyn Elise. 2009. “Taking Custody of Motherhood: Fathers’ Rights Activists and the Politics of Parenting.” Women’s Studies Quarterly. 37(3/4): 223-240. Crowley, Jocelyn Elise. 2009. “Fathers’ Rights Groups, Domestic Violence, and Political Countermobilization.” Social Forces. 88(2): 723-755. Crowley, Jocelyn Elise. 2009. “Conflicted Membership: Women in Fathers’ Rights Groups.” Sociological Inquiry. 79(3): 328-350. Crowley, Jocelyn Elise. 2008. “On the Cusp of a Movement: Identity Work and Social Movement Identification Processes within Fathers’ Rights Groups.” Sociological Spectrum. 28(6): 705-724. Crowley, Jocelyn Elise, Margaret Watson, and Maureen R. Waller. 2008. "Understanding “Power Talk”: Language, Public Policy, and Democracy." Perspectives on Politics. 6(1): 71-88. Crowley, Jocelyn Elise. 2007. "Friend or Foe? Self-Expansion, Stigmatized Groups, and the Researcher-Participant Relationship." Journal of Contemporary Ethnography. 36(6): 603-630. Book Review: Creating Gender: The Sexual Politics of Welfare Policy. By Cathy Marie Johnson, Georgia Duerst-Lahti, and Noelle Norton. Boulder, CO: Lynne Rienner Press, 2007, for Politics and Gender. 3(4): 546-548. Crowley, Jocelyn Elise. 2006. "Adopting 'Equality Tools' from the Toolboxes of their Predecessors: The Fathers' Rights Movement in the United States." in Fathers' Rights Activism and Law Reform in Comparative Perspective, edited by Richard Collier and Sally Sheldon, pp. 79-100. Oxford: Hart Publications. Crowley, Jocelyn Elise. 2006. "Organizational Responses to the Fatherhood Crisis: The Case of Fathers' Rights Groups in the United States." Marriage and Family Review. 39(1/2): 99-120; Reprinted in Families and Social Policy: National and International Perspectives, edited by Linda Haas and Steven K. Wisensale. 2006. New York: Haworth Press. Crowley, Jocelyn Elise. 2003. "The Gentrification of Child Support Enforcement Services, 1950-1984." Social Service Review. 77(4):585-604. Crowley, Jocelyn Elise. 2002. "The Rise and Fall of Court Prerogatives in Paternity Establishment." Justice System Journal 23(3):363-376. Crowley, Jocelyn Elise. 2001. "Who Institutionalizes Institutions? 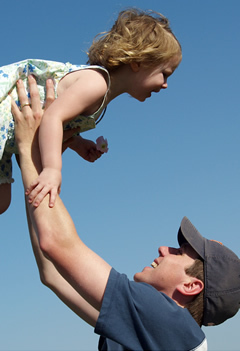 The Case of Paternity Establishment in the United States." Social Science Quarterly. 82(2): 312-328. Weiner, Marc D., Orin T. Puniello, Paul C. Siracusa, and Jocelyn Elise Crowley. 2017. “Recruiting Hard-to-Reach Populations: The Utility of Facebook for Recruiting Qualitative In-Depth Interviewees.” Survey Practice. 10(1): 1-13. Combs, Kathryn L., Jocelyn Elise Crowley, and John A. Spry. 2014. “The Effect of New Jersey Lottery Promotions on Consumer Demand and State Profits.” Eastern Economic Journal. 40(3): 326-348. Gano, Gretchen, Jocelyn Elise Crowley, and David Guston. 2007. “‘Shielding’ the Knowledge Transfer Process in Human Service Research.” Journal of Public Administration Research and Theory. 17(1): 39-60. Crowley, Jocelyn Elise, Brian Roff, and Jeneve Lynch. 2007. "Encouraging at Risk, HIV Populations to Respond to Research Surveys: Does a Community Identity Link Help or Hurt?" Health Education and Behavior. 34(1): 55-70. Crowley, Jocelyn Elise. 2006. "Moving beyond Tokenism: Ratification of the Equal Rights Amendment and the Election of Women to State Legislatures." Social Science Quarterly. 87(3): 519-539. Crowley, Jocelyn Elise. 2004. "When Tokens Matter." Legislative Studies Quarterly. 29(1):109-136. Spry, John A. and Jocelyn Elise Crowley. 2004. "Assessing the Implications of Monopoly Toll Road Service Areas." Eastern Economic Journal. 30(3):381-398. Crowley, Jocelyn Elise and Theda Skocpol. 2001. "The Rush to Organize: Explaining Associational Formation in the United States, 1860s-1920s." 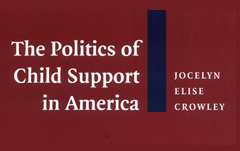 American Journal of Political Science. 45(4):813-829. Crowley, Jocelyn Elise. 2018. 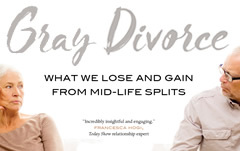 Gray Divorce: What We Lose and Gain from Mid-Life Splits. Oakland, CA: University of California Press. Crowley, Jocelyn Elise. 2013. Mothers Unite! 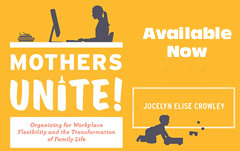 Organizing for Workplace Flexibility and the Transformation of Family Life. Ithaca, NY: Cornell University Press. Crowley, Jocelyn Elise. 2008. 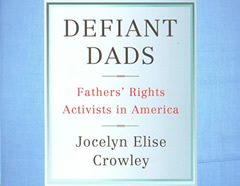 Defiant Dads: Fathers' Rights Activists in America. Ithaca, NY: Cornell University Press. Crowley, Jocelyn Elise. 2003. The Politics of Child Support in America. New York: Cambridge University Press. Crowley, Jocelyn Elise with Marc Weiner. 2010. “What Mothers Want: Workplace Flexibility in the Twenty-First Century.” Report to the Alfred P. Sloan Foundation, New York, New York. (Click on title to view document).